Activist of the Movement for Freedom Zmicier Rabcevicz calls the government to come up to the parliament with the suggestion to exclude one-person pickets from the operation of “Law on mass events in the Republic of Belarus”. 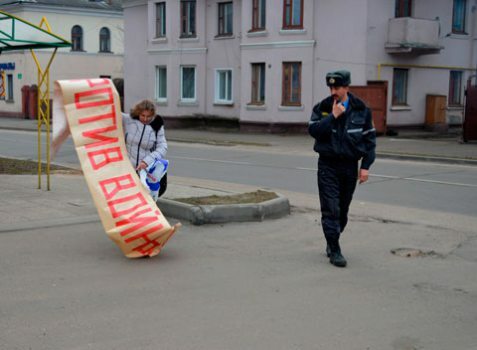 In his appeal, sent to the Council of Ministers of the Republic of Belarus, Rabcevicz admits that now there is an abnormal situation when the mentioned law regulates conducting one-person events like pickets. Activist of the Movement for Freedom considers that his changes to the law will allow citizens to exercise their right to voice their opinion in a greater degree. Human rights defender Raman Kisliak espouses this view. He considers the appearance of the word group “one-person mass picket” in the mentioned law to be absurd. In his opinion, “legal restrictions of this law are relevant for real mass events, but not for one-person picket”. Human rights defender specified that in other countries citizens can hold one-person pickets without getting permissions and without restrictions determined for mass events.